This brush will fit all Spartan Series saws. 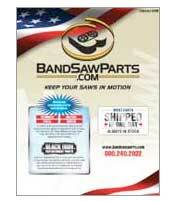 This includes all PA-10 ,PA-13 and PA-18 bandsaws. Sold as a pack of two brushes. Replacement Blade Guides for the Spartan and Phoenix PA10 bandsaws that run 1" band saw blades. Sold as a set including the 10-BD1 (shown)10-BD2,10-BD3 & 10-BD4. It is also recommended to change the Back-up guide 10-BD5 as well.